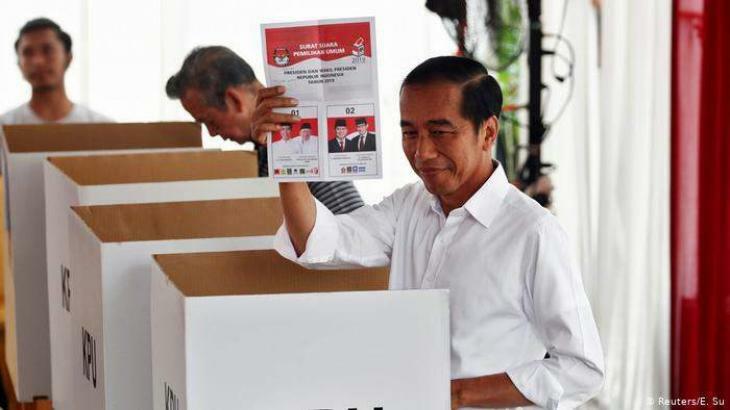 BANGKOK (UrduPoint News / Sputnik - 17th April, 2019) Incumbent Indonesian President Joko Widodo has taken a lead in Wednesday's presidential election over his competitor, retired Lieut. Gen. Prabowo Subianto, exits polls showed. On Wednesday, Indonesia is holding presidential and legislative elections. The preliminary results were published by public opinion research agencies � Litbang Kompas и CSIS - Cyrus Network. According to Litbang Kompas, as of 3 p.m.
local time (08:00 GMT), the incumbent president is winning with 55.49 percent of the vote, while his rival has secured 44.65 percent. CSIS - Cyrus Network data, meanwhile, showed that Widodo is leading with 56.20 percent, while Subianto is trailing behind with 43.80 percent. The figures are, however, constantly changing as additional information obtained by research agencies becomes available. The official preliminary results may be announced on Wednesday evening.